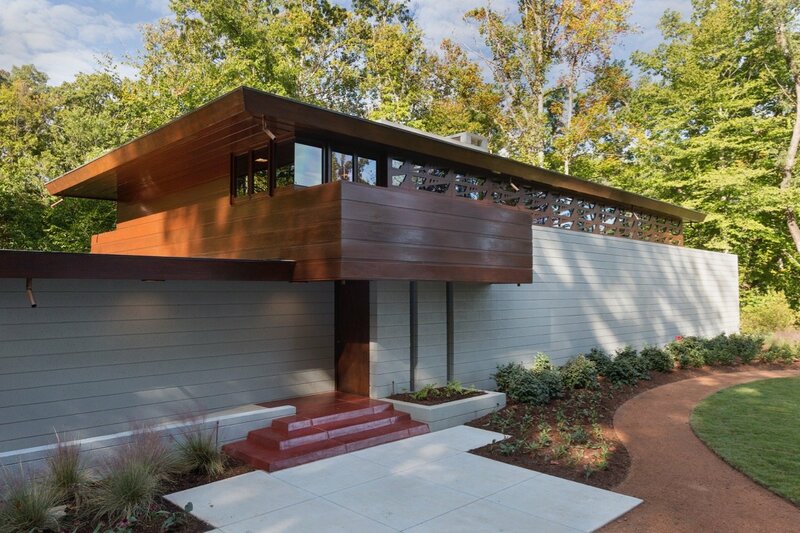 This house is among the few Frank Lloyd Wright houses to have been relocated. 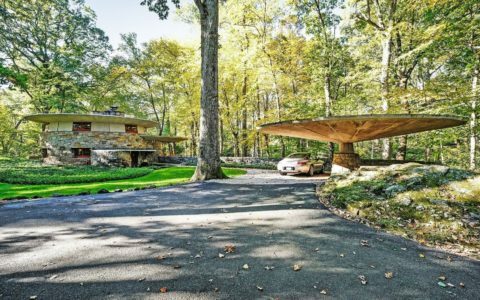 Originally situated on the bank of the Millstone River in Millstone, New Jersey, it now resides all the way over in Arkansas. 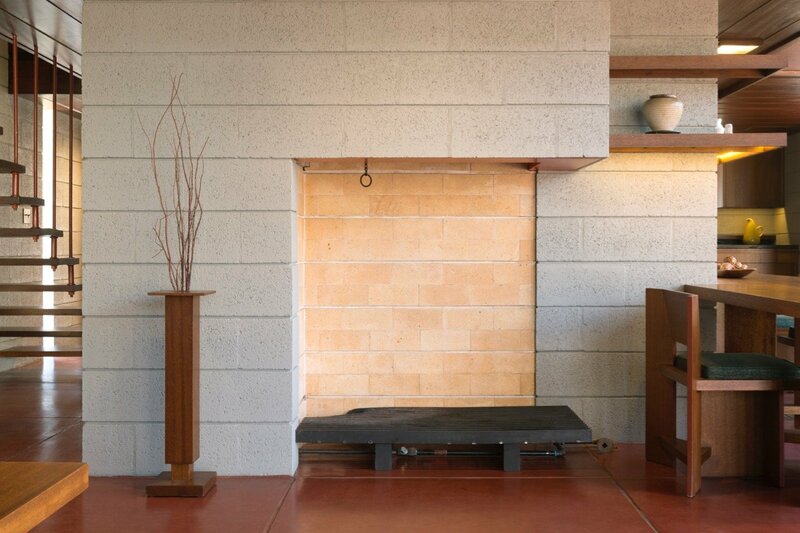 The house was originally built in 1954 for Abraham Wilson and his first wife, Gloria Bachman, whose brother Marvin had studied alongside Wright at Taliesin West. 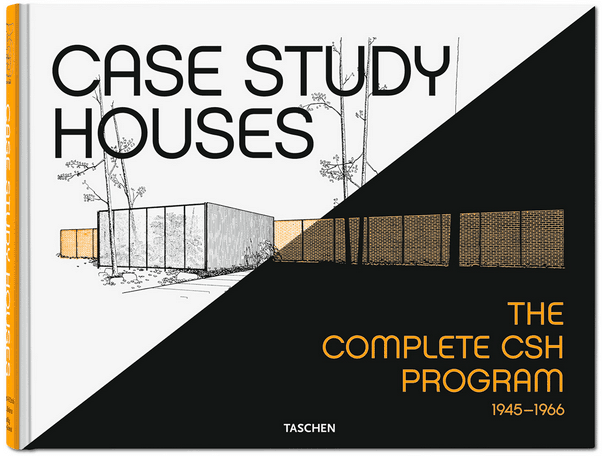 Yet its remarkable journey was set in motion when the house passed into the hands of Lawrence Tarantino, an architect, and his wife Sharon. 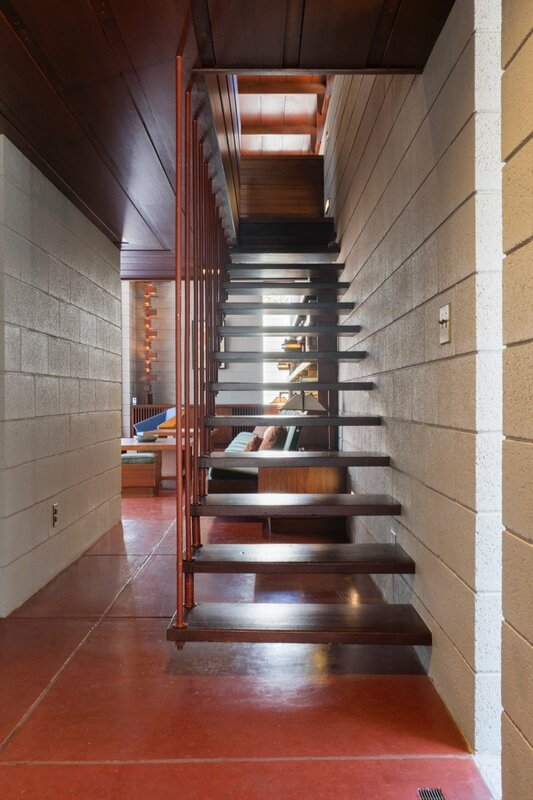 Having had two owners since the Bachmans moved out in 1968, the Tarantinos bought the mid-century house in 1988. They set about restoring it right away. However, after a decade living in the property it became apparent that flooding from the nearby river was an insurmountable threat to the long-term future of the house. 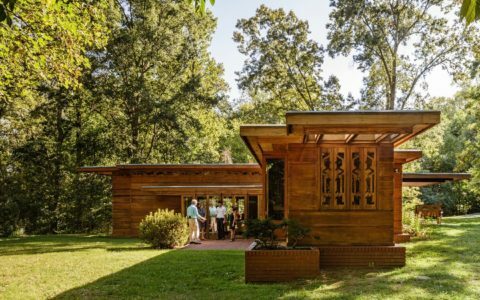 After a lengthy search, they finally found support from Crystal Bridges Museum of Modern Art in Arkansas, and moved the house 1,200 miles to the museum’s campus, thus making it Arkansas’ first Frank Lloyd Wright house. The relocation has been so successful that you’d be forgiven for thinking this is where the house had always been, especially since it still remains by the water (this time a spring that doesn’t flood). 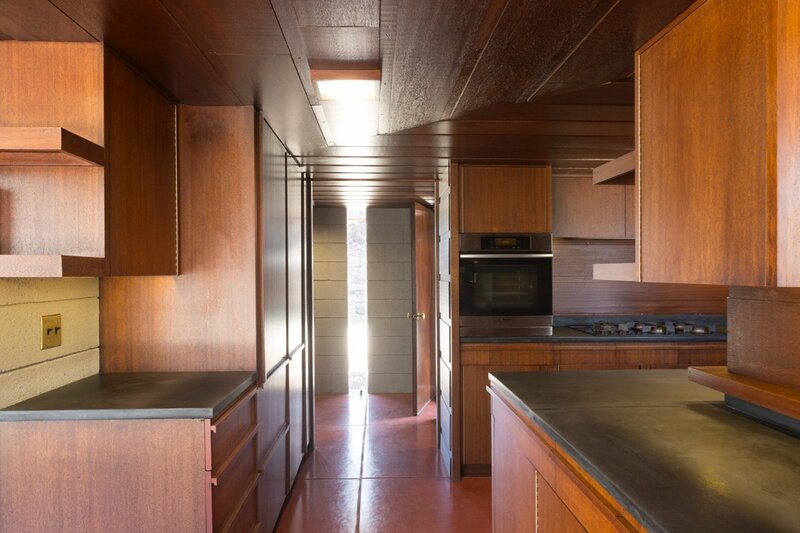 Speaking of the design, arguably the most distinctive feature is the wood panelling featured in different ways throughout this mid-century design. The kitchen is a particular delight. 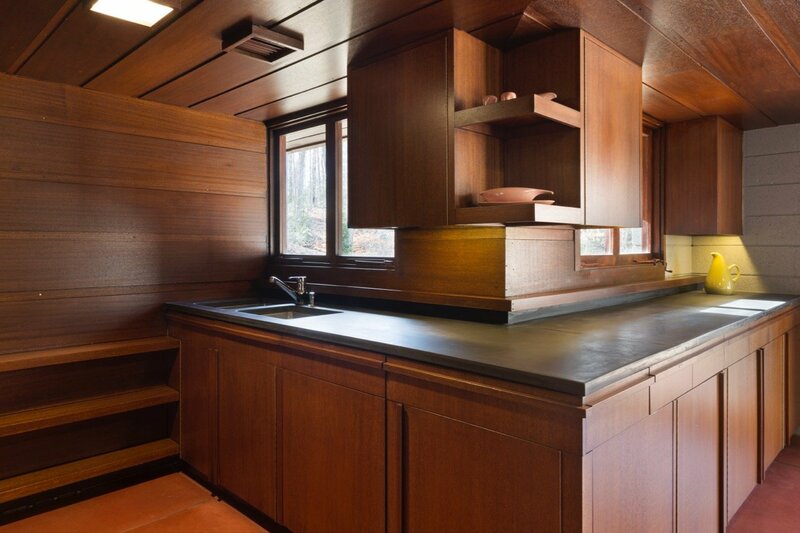 With wall panels, cupboard doors, ceiling and light fixtures all decked out in the same polished mahogany. Such consistency means the kitchen really packs a punch. 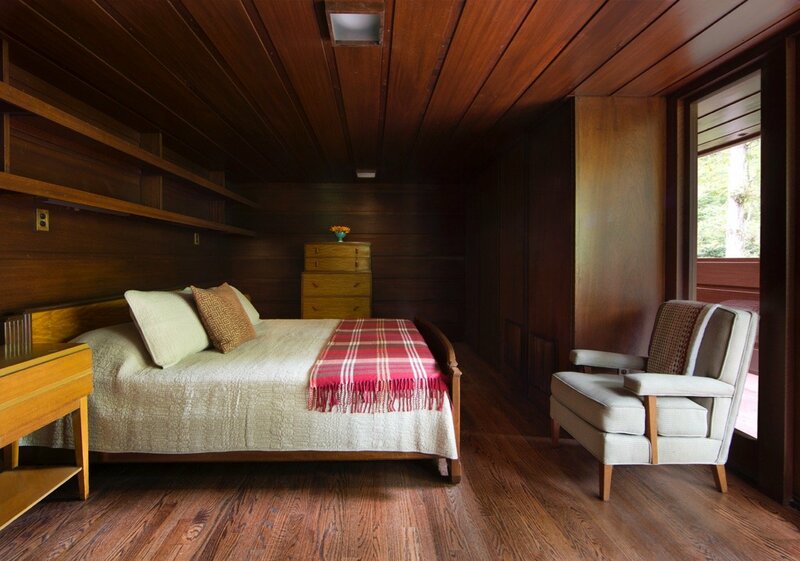 Meanwhile, the second bedroom takes this a step further, with the addition of mahogany wood panel flooring, along with mahogany furniture, shelving and cupboards to accompanying the panels on the walls and ceiling. It’s a veritable barrage of high quality material. 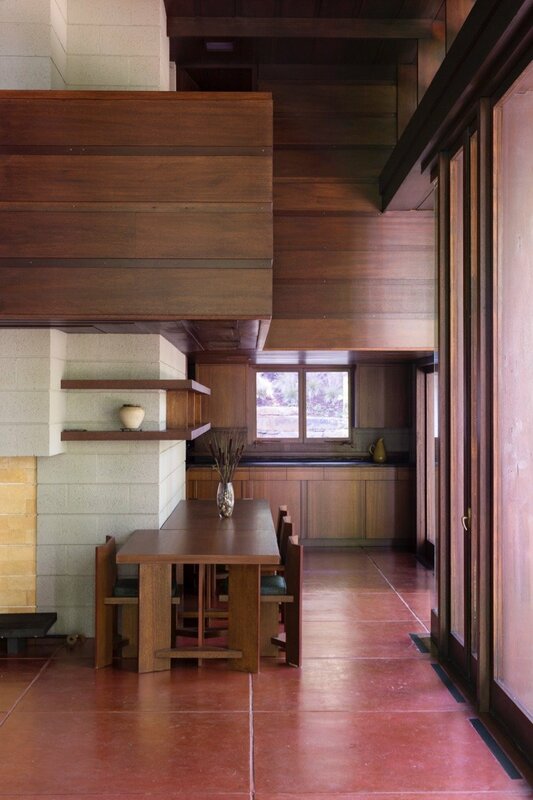 Speaking of mahogany, the wood is also used on the home’s exterior to magnificent effect. 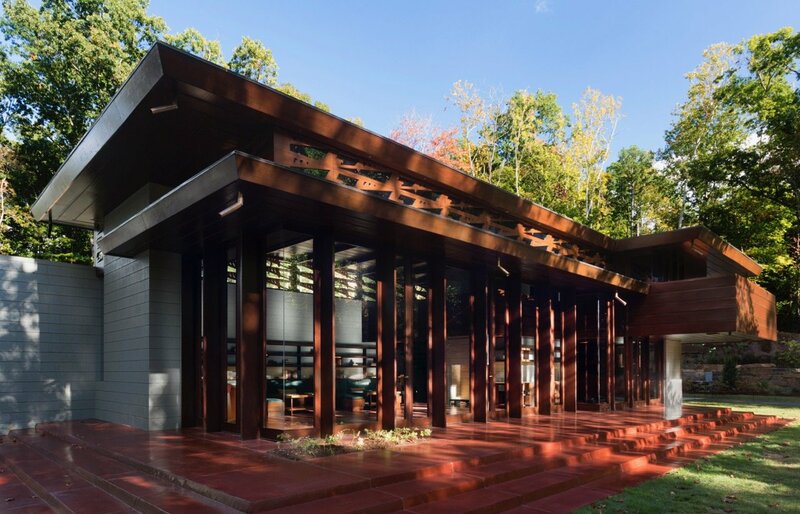 The simple, yet intricate and decidedly elegant roof overhang is textbook Wright, drawing on the precedent of Eastern design but adapting it to the American context. 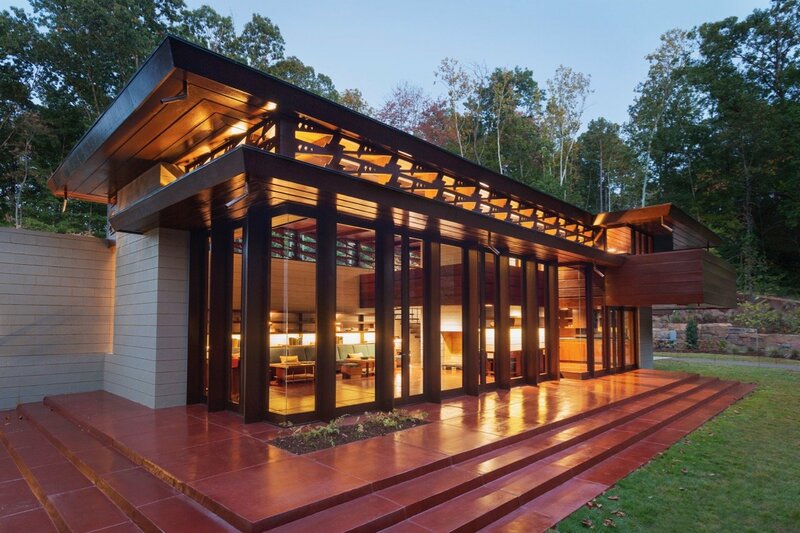 Besides that, some tell-tale signs that this is a Frank Lloyd Wright house are the elongated layout, loosely mirroring the flat waterside landscape in both its old and new location; also, the concrete-block masonry, new for its time, ensuring privacy from the street; and finally, the expert use of clerestory windows, with frames featuring a hand-carved pattern that creates a lovely dappled effect as the sun shines through. 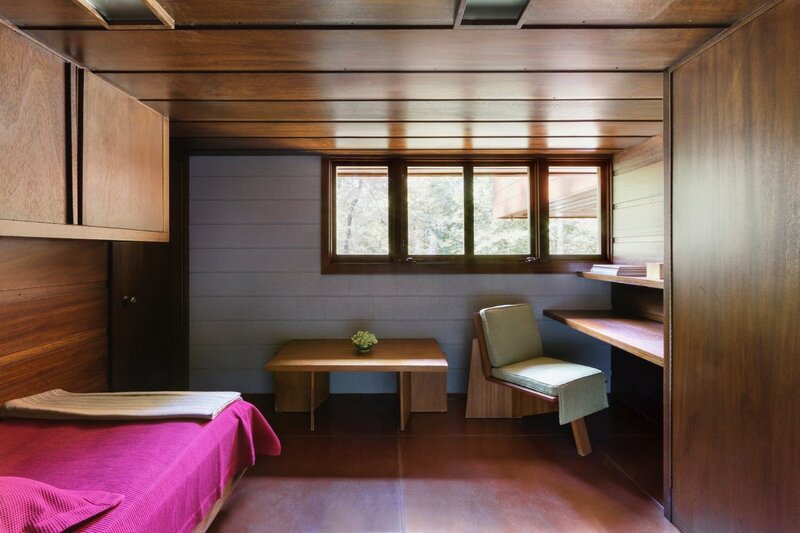 Intended to enhance the airflow and provide light without sacrificing privacy, these clerestory windows are seen in a lot of Frank Lloyd Wright homes. 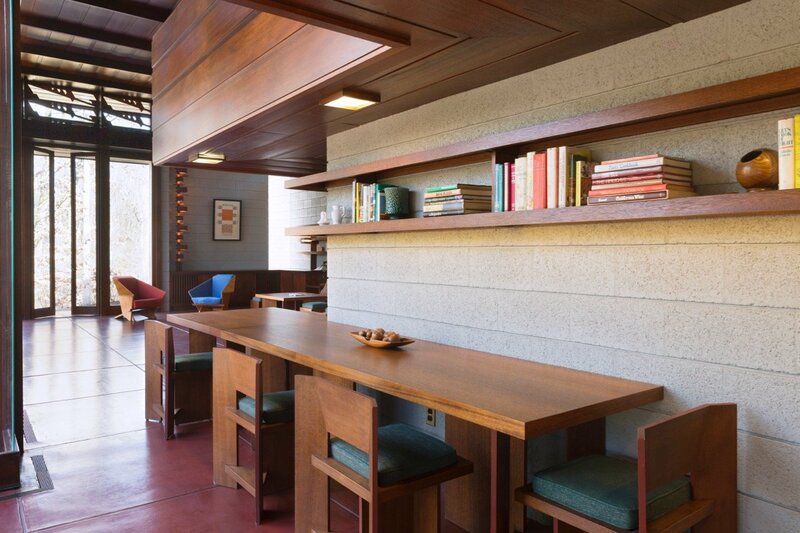 Indeed, just recently extolled the virtues of the clerestory window with reference to Wright’s Sol Friedman House. Yet the ones found in the Bachman Wilson House are much more intricate. 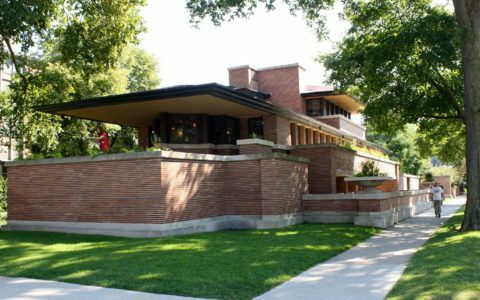 Like all Frank Lloyd Wright houses, high-quality materials are harnessed to create an almost fortress-like sturdiness. It is nice to see that such sturdiness is still evident after successive floods and a 1,200-mile relocation. 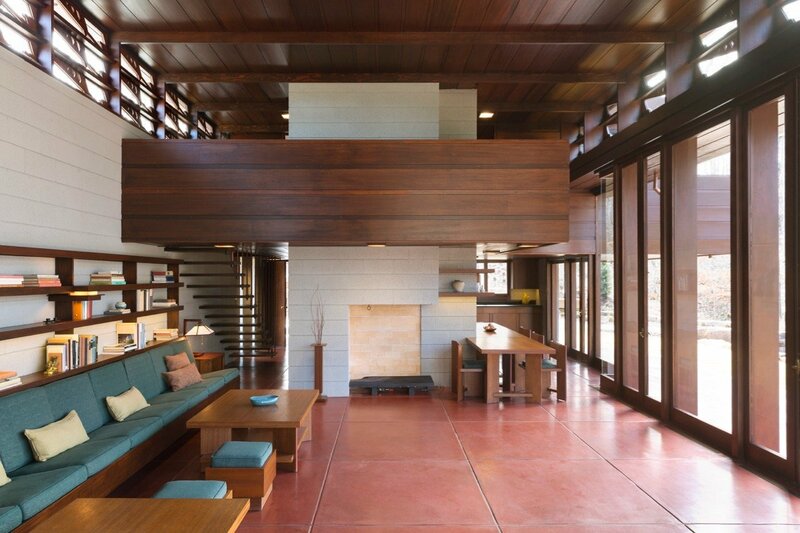 Hats off to the Tarantino’s for their commitment to maintaining this wonderful home. Photos by Nancy Nolan Photography. Courtesy of Crystal Bridges Museum of American Art.